. . . . . . . . The Vintage Bazaar! one roof and a great truffling session. When you walk through the Corn Exchange doors you are greeted by the lovely Jack and Mike and the anticipation of walking around, chatting to people and other wise catching up with great like minded friends, it was a tonic. There was snow falling and it was rather chilly but oh so magical. It was bitterly cold outside but inside was toasty and warm and the music was playing in the background. Lots of people I knew and lots of catching up and chatter it was so wonderful and a pure tonic. I had my list, basket and purse, camera for photos I was set for a great few hours of vintage rummaging and relaxation. The work that goes into this event is enormous and both Liz and Clare along with their respective husbands really do work hard to make sure every detail is just so, so that everyone who walks through the doors can have a wonderful time at such a great vintage fair. There were lots of lovely people dressed for the occasion and I was able, with their permission, to take some photos for you to see. As I walked through the door who should I see but the lovely Liz of The Washerwoman fame! As you all know by now she is one of the co organisers of the VB. There was her beautiful French fabrics and vintage goodies all laid out perfectly. 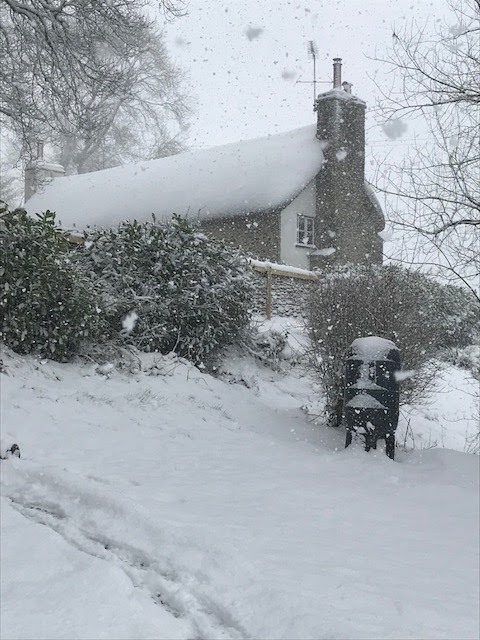 It was a very cold day on Saturday and the wind was whipping up and the snow was falling, Liz was right by the door in the foyer and as cold as it was she was smiling away and chatting to all the lovely customers walking through the door. Then as I wandered along who should be there a little way down but Jane of Kiss the Book and her always gorgeous stall with antique books all laid out beautifully. I love books as you know and this is one of my favourites to have a jolly good truffle. I had asked for her to find me some bits and as always she had come up trumps. We had a coffee together and a general catch up and also I got to see her two gorgeous girls as well. Worth the visit just for that alone. Isn't her work exquisite! who could resist that face! .. well not me ..
Now ladies and gents you are in for a real treat because who should be there but Lucky George and his lovely wife Gracie. They were both dressed beautifully as you can see from the photo. However I would like to pay extra attention to Gracie's outfit, it is a 1939 ski suite that was made for Fortnum and Mason's and there were a very limited addition of them. On the day when the wind was howling and the snow was falling it was a perfect day to wear it out. I was thrilled they were kind enough to let me take a photo of the handsome pair. Then I spotted Laura and Phil of Savoy Art Deco Collectibles with there most beautiful pieces. I was taken with the gorgeous lamp you will see in my photo, it was so unusual. I am trying not to buy pieces for a house we have not moved to yet or indeed found as you know, it took every ounce of restraint I can tell you. Look at the pieces that I photographed ... stunning! Bumping into friends who were there to buy as well and the music that was playing had everyone, even the stall holders jiggling, It was impossible not to. Then it was time to find Sarah of The Blueberry Patch as I had made an order some weeks prior and it was time for me to pick it up. It was lovely to see her and hear all about the excitement of one of her very talented children who had been to see the university of his choice to study medicine. Vintage-On-Sea was there and oh my there were some gorgeous fabrics and some rather beautiful vintage china as well. I was able to not only take some photos but have a great little truffle about it was wonderful. Look at that china! all set out beautifully so you could see all the details on the pieces as well. I might have come away with a few bits! and her choice of outfit on this cold snowy day looked cosy and warm. I asked and she said yes so here we are ladies and gents - how lovely does she look! The coat with the collar that on a day like Saturday kept her looking and feeling cosy and warm. Susie and Russell Needham were there with a large stall full of fabulous fabrics. There were checks, stripes and floral. All set out so well you could see each piece. It was a large stall and so I snapped away at some of the neat stacks just to show you the variety and quality. If you were a dress maker you would have had a hard choice choosing what to purchase. Right next door was Leagrave Antiques and Vintage now just feast your eyes on some gorgeous hats and look at that Victorian gown as well. I was in heaven looking around here and truffling about taking photos for you all to see. Button up boots and a gorgeous brooch too, it really was an eclectic array of goodies at its best. Notice the hats for sale with a handbag and shoes ... Such gorgeous goodies. Belinda Sharples was there and she had some really beautiful things on offer from fabric, antique quilt scraps, haberdashery and so much more. I did not know where to start or what to look at first it was a really lovely display of vintage goodies. I spent a long time here looking and snapping photos. Fenela Sadler Vintage was there and you just had to stop and stare, with some really rare and beautiful finds on offer. I was in heaven truffling about on this stall. Gorgeous bridal head dresses and veils, handbags, shoes, vintage stockings still in their original packages ... it was outstanding! Linda Campbell was there and as always their was so much to see and look at from very old and rare toys to buttons on their original cards and hand painted designs and so much more. Shoes and cards with trimmings and lace. I spent a long time here trying not to miss anything. Such a pleasure to truffle in and yes I picked a little something up! Isobelle was there this time as well and always has such gorgeous haberdashery and fabrics on offer. There were cards of tiny antique mother of pearl buttons as well as feathers, beads, milliners flowers to name just a few bits of boxes and baskets of gorgeous vintage goodies. Now can you guess some of what I purchased on here? 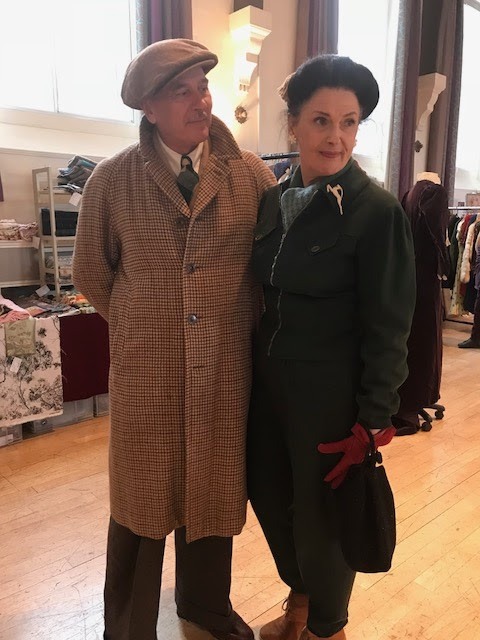 Then I bumped into this dapper chap, Rowan was there and as always looking wonderful in a warm looking 1940's outfit complete with coat and hat. We had a little catch up and he was happy for me to take a photo for you all to see. Honestly there is something about this era and the way men dressed, call me old fashioned if you like but I think it looks so good. It was such a wonderful event and such a great way to spend a few hours on a Saturday. 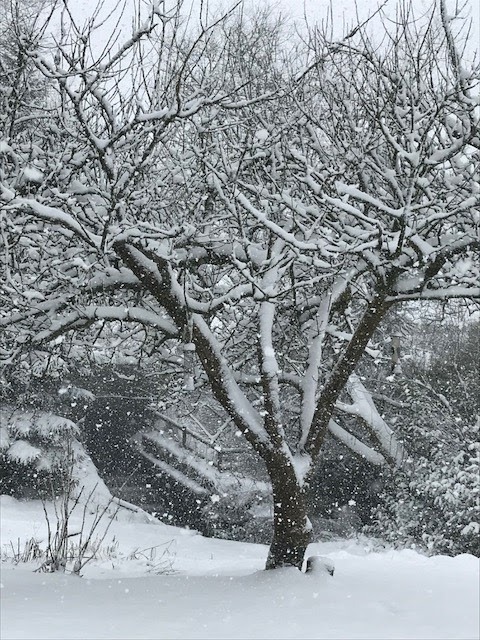 The snow was falling and it was time for us to go and get some lunch before heading to our friends in Devon. The snow was coming down fast now and we had a quick lunch and headed on our 2 hour journey. We arrived safely and dinner was prepared for later and the snow kept coming. We had such a great evening and did not head back until Sunday afternoon and a great Sunday roast that had been cooked for us. There was way over a foot of snow that had fallen and it was winter wonderland there. I actually did not want to leave but having a 4 x 4 meant it had to be more that a few foot for us not to be able to get out of Devon and home to the South Coast by the sea. As you can see it really was coming down and yes I did do yet another snow angel for the second time this year. 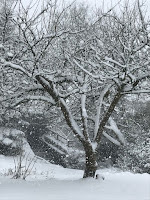 I have had my wish of snow and now I am so ready for Spring and some warmer weather. 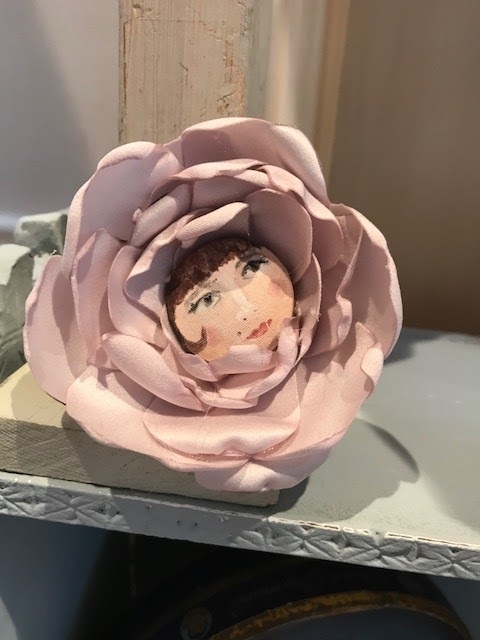 I hope you have all enjoyed your little peek at the Vintage Bazaar and that you will be back here on Thursday for a look at some of the treasures that I managed to truffle there. I will leave you with another photo of Lucky George and Gracie in her most gorgeous skit suit ... I think it has such a wow factor, don't you? Yes these people actually make it their lifestyle, can you imagine how gorgeous the contents of their respective wardrobes are?! It was a busy weekend to top of a hectic 6?weeks. Pleased you enjoyed the write up, it was a wonderful day. Thank you Lora! Yes I love to let others who could not be there see it through my lense. It makes a interesting read and a different read for everyone!